Shelby Averill is pictured at Pittsfield Middle High School learning Spanish via computer. CONCORD – Attorney Natalie Laflamme loved high school. A 2007 graduate of Berlin High School, Laflamme played four years of field hockey, played in the band and sang in the chorus, and studied Spanish. She was able to spend a semester in Valparaiso, Chile, as an exchange student and was thrilled when she was accepted to Georgetown University in Washington, D.C.
After graduation, she earned a law degree at Duke University and with her husband, returned to New Hampshire – but not to Berlin. She currently works at the Concord law firm Sulloway and Hollis. Laflamme said she struggled in college. “I had to work so much harder in college (than her peers),” she told the New Hampshire House Education Committee recently. Laflamme told lawmakers that a lack of electives at her high school coupled with a lack of choices for afterschool learning opportunities – or co-curriculars – left her at a distinct disadvantage at Georgetown. She took both Advanced Placement courses offered at Berlin High School at the time – one in English and one in calculus. And without sea change in the way the state funds school districts, especially those with lower property values, Laflamme said she only sees fewer and fewer opportunities for today’s students. Pittsfield Superintendent John Freeman said his district is already at bare bones financially. In a quiet language classroom near the main office, the posters on the wall at Pittsfield Middle High School are all in Spanish. But there is no Spanish class, only 15 computer stations and a paraprofessional educator monitoring a class of four students who are learning by computer. Junior Shelby Averill said learning through Rosetta Stone has its pros and cons. She likes learning at her own pace, within reason, and absorbs as much Spanish as she can. She doesn’t like not being able to participate in any Spanish conversations with her classmates and friends. Tammie Massicotte supervises the language classroom and monitors student progress on her computer screen. “They lack the ability to apply it to anything but a computer screen,” Massicotte said. Freeman said this is the first year that students have had their foreign language requirement met through Rosetta Stone. A student can get two years of credit toward college admissions for completion of four semesters of Rosetta Stone, but Freeman said it is not optimal for college acceptance or for learning. 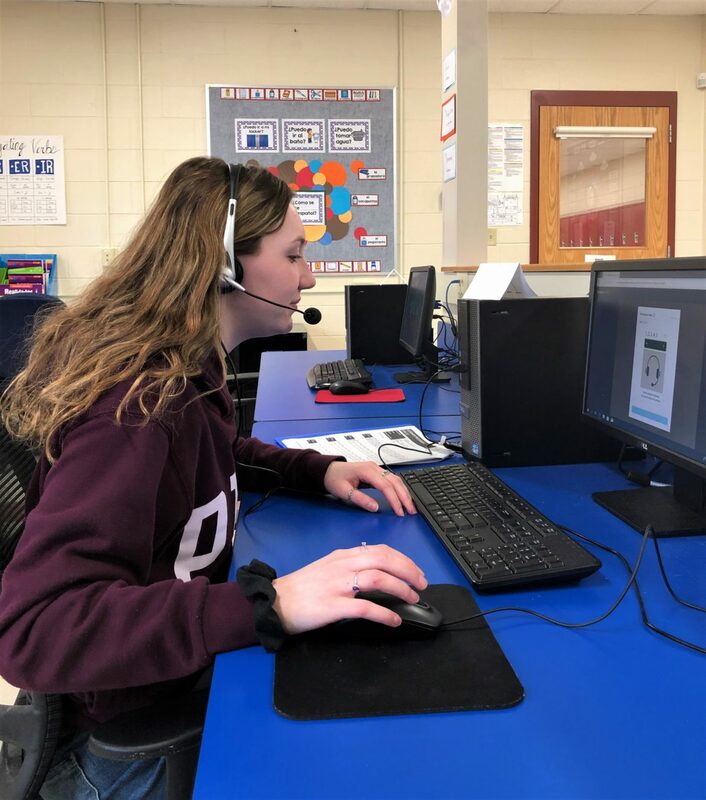 “Students who want to can take a third year through VLACs,” he said, referring to the same Virtual Learning Academy used by most districts for other electives. Freeman said the school is operating on a default budget and cuts were necessary. Among them were Spanish and woodworking. There are no AP classes except those that can be taken through VLACs. Freeman said they were able to re-establish the drama club, but only after local sponsors and parents stepped up with the funding. Averill was a member of the drama club as a freshman, but when it was cut, she lost interest. She played volleyball, but said it was cut this year. “I really liked volleyball,” she said. Facing the loss of more stabilization money for the next budget year, Freeman said he had no place left to cut. His district spends $13,899 on co-curricular activities for around 580 students or at about the same per-student level as Berlin. Freeman said that with an equalized value of $469,334 per student, he is unable to provide many after-school programs and electives. Freeman said the district tries to provide activities for every student who expresses an interest and aims for a 100 percent participation rate, but sometimes it’s just not possible. He said the district is at about 29 percent this academic year. As a solution, Freeman said he would like to see the state provide some equity for Pittsfield and others such as Berlin and all of the students in the state. “The present system is not equitable for students or property taxpayers,” said Freeman, who added that it is a struggle in Pittsfield just to get basic programming that meets the minimum requirement of the state, including a foreign language. Co-curricular activities and electives, said Laconia School Superintendent Dr. Brendan Minnihan, round out a student’s education. They include after-school activities such as drama, chess club and yearbook, civic leadership organizations like Key Club and classes like Advanced Placement courses. “They lead to camaraderie within the group (and) allow students who otherwise might not have the opportunity to take on leadership roles. Participation in clubs also helps to form bonds between students, faculty and the larger school community,” Minnihan said. For many students, participation in a club or activity is a highlight of their school day, he added. Berlin has grown its AP offerings since Laflamme’s graduation and, according to Superintendent Corinne Cascadden, the school district is partnering with White Mountain Community College for “running start” classes, which give high school students opportunities to earn college credit. Additionally, she said there are some preliminary discussions with the Gorham School District for some coordination for additional AP classes to augment the literature, composition, history, statistics and psychology classes they are able to offer. There are internet AP choices through the Virtual Learning Academy. Clubs, like Spanish and chess club, drama programs, yearbook, and school newspapers cost money for teacher and volunteer stipends, equipment and supplies and transportation. More losses in stabilization funds will mean deeper and deeper cuts in co-curriculars, electives and sports for property-poor school districts like Berlin, Pittsfield and Claremont, districts that are already on the low end for offerings. Cascadden said in Berlin, she can’t see where she can cut any more programs. Cascadden said the total budget for co-curricular activities is $44,309 for a district with an average of 1,077 students. According to the New Hampshire Department of Education website, the fiscal year 2017 equalized property value, or the amount of money per student raised through property taxes, in Berlin was $325,535. In the Inter Lakes School District it is $2,916,980. The equalized property value per student in Portsmouth is $2,630,000 while in nearby Rochester it was $593,282 for the same fiscal year. And while most school administrators, school boards and taxpayers are in the middle of another budget season, state legislators are debating a number of bills that address school funding to level the playing field. Executive Councilor Andru Volinsky and Attorney John Tobin have been touring the state providing information about education funding inequities. They say New Hampshire should live up to the Supreme Court Claremont I and Claremont II decisions mandating all New Hampshire children have access to an adequate education.